Still playing with the moodboard at Our Mixed Media Moods, this time I took my inspiration from the fourth picture in the first row: fabrics, crosses and black, white + kraft. 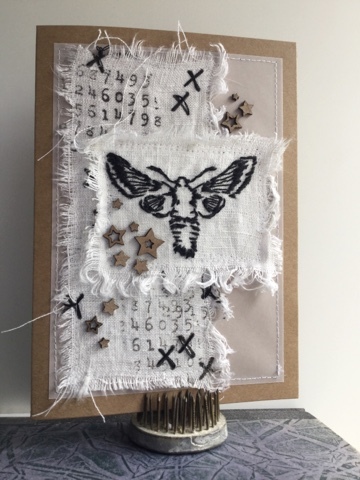 Since my project fits several other challenges, I'm also linking to the Designs by Ryn customer creations challenge, the Paperartsy challenge (from light to dark, contrasts, layers) and the Country View challenge (Things With Wings). All the links are at the end of this post! 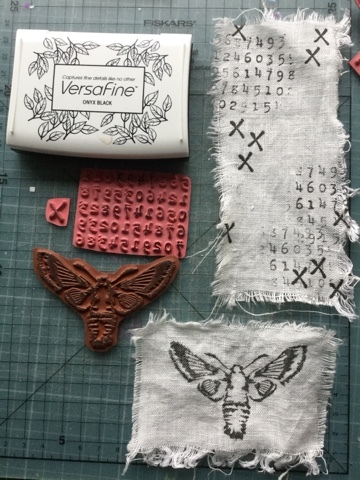 I started with a couple of pieces of linen and stamped my images: the pink stamps are from VivaLasVegaStamps and the moth is from Designs By Ryn. Apart from these, I used a layer of white vellum to break the contrast between the kraft and the linen (and because otherwise the kraft would have shown through the linen. All the layers were sewn on a kraft card base. 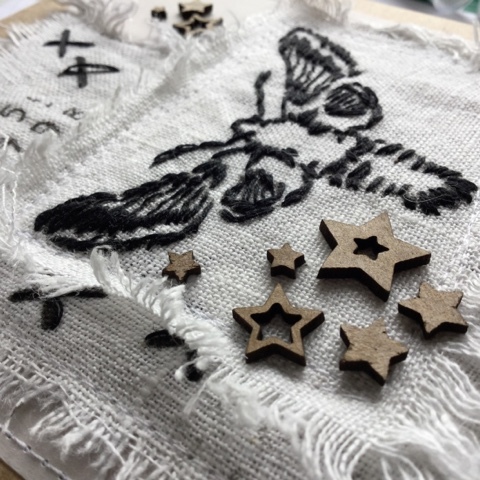 I wasn't planning to do anything complicated, but ended up stitching the moth (and the crosses) with black DMC... it's probably as close to embossing as possible on fabric, and really gives a good contrast against the white. 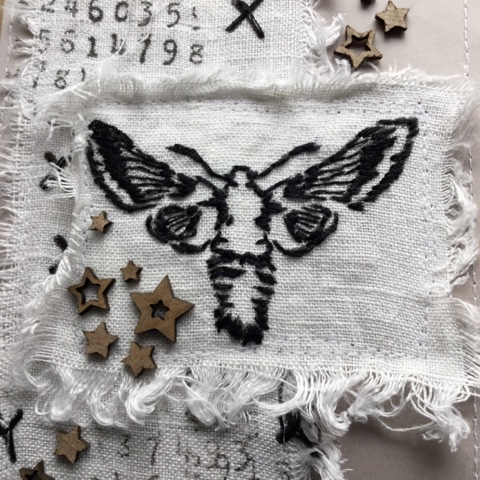 I do think they turned out quite cool, even though embroidery really isn't my cup of tea :) The chippies are star confetti from Umwow Studio, and besides having lovely varied shapes also had the perfect dark kraft colour. I just glued them down and was done! What a neat idea, it looks very great. Also like the fraying edges, well it all looks lovely.